Take a piece of the Blue Ridge Parkway with you everywhere you go by purchasing a North Carolina specialty license plate for your car or motorcycle. For each new or renewed specialty plate fee, $20 goes to the Blue Ridge Parkway Foundation to protect and enhance the scenic route. An additional $10 supports the N.C. Department of Transportation Wildflower Program. The entire specialty plate fee of $30 is tax deductible. Join thousands of drivers proudly displaying their support for this exceptional place. Please call us at 1-866-308-2773 if you have any additional questions. We are happy to help. Thank you for proudly displaying your support for this exceptional place. If you live outside North Carolina, you can show your support for the Blue Ridge Parkway with a RIDE front plate. 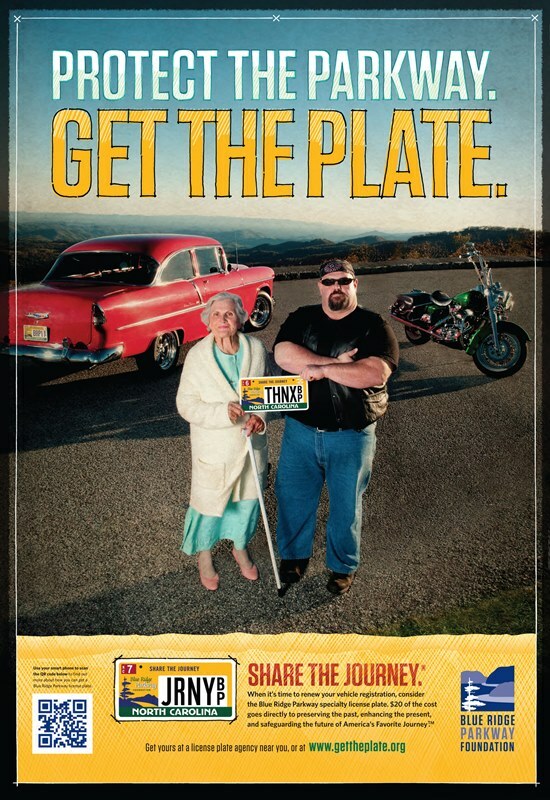 A portion of sales from these vehicle and motorcyle plates supports our efforts on the Blue Ridge Parkway.